Take 2 capsules a day with a meal or independently of a meal. Natural extract from a special variation of Chinese mushrooms. Very safe for the organism and non-toxic. To strengthen the organism and improve immunity it is recommended to take 2 capsules a day. In order to ensure optimal assimilation, it is worth using during meals. 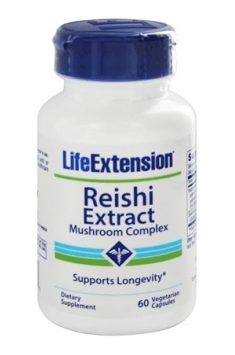 Reishi mushroom extracts are standardized for the content of polysaccharides – the most important pharmacologically active compounds. It is worth knowing that their solubility and absorption is more effective in the presence of vitamin C. For this reason, the preparation should be taken with food that contains large, natural amounts of vitamin C or combined with the supplementation of synthetic vitamin C.